Custom Turnkey Stamping System for a work cell – StampTech Inc.
StampTech Inc. is a proud member of the MDNA and the PMA. We adhere to their stringent code of ethics and Industry standard business practices. Remarks : Customer required 2 presses for a Hand Feeding Operation. 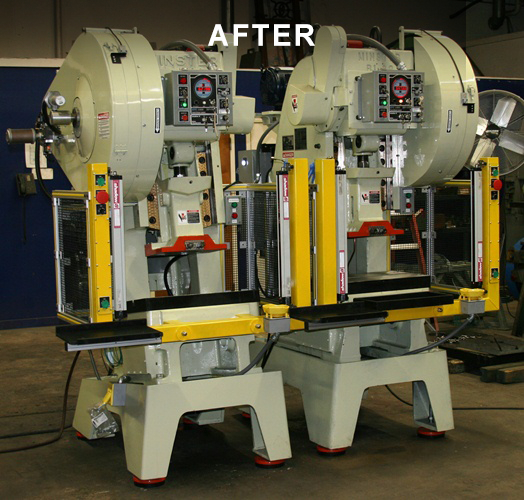 They had to have a 42″ distance between Ram centers, a 37″ height to top of Bolster and one press (left press) had to incline at 10°. 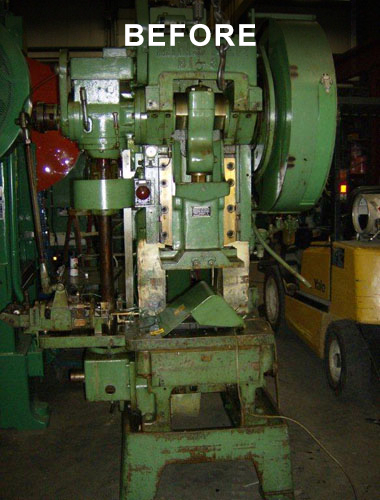 Being a “Hands in Die” operation they had to be fully compliant with the latest safety requirements and not hamper production.In addition, to re-manufacturing the presses, we remounted one flywheel on the left side of the machine to allow for the 42″ distance required. We also had to fabricate a new base with a 10° incline (left press). New Wintriss Press Controls were added; we installed the “Swift Trip” feature for ergonomic hand feeding (which greatly increased their productivity). Trays were also installed to store parts. A test runoff of parts was performed at our facility for acceptance and approval prior to shipping.